What happens when a team of parents starts dreaming up a whacky idea like getting chickens at their kids' elementary school? Well, they form a chicken committee, research all things chicken and coop related, ask a bunch of questions, attend one backyard chicken class, solidify funds, get permission and make it happen. Why chickens at a school? We thought it would be great if the students of Oscar Mayer could witness first hand where our food comes from. Chicken nuggets just don't fall from the sky and eggs just don't appear at the store. We feel that it's imperative that our kids start learning at an early the age the importance of healthy food choices and the benefits you reap when you work hard. Another lesson we hope to relay: don't be scared of the unknown. As of last January, not one member of the Chicken Committee really knew that much about chickens. A few of us had hung out with a chicken or two but we really had no idea how we would make this happen. Here we are 10 months later with an amazing coop, 6 beautiful and very happy hens and a whole community of kids and adults who have embraced this project whole-heartedly. When over 40 families at your school have asked to volunteer to pick up chicken poop it's a sign that your instincts were correct. Plus, chickens are a wonderful addition to any garden. The chickens eat bugs off of the plants, their poop is a wonderful addition to our compost, which is then added back into our garden soil in the fall and the cycle continues. 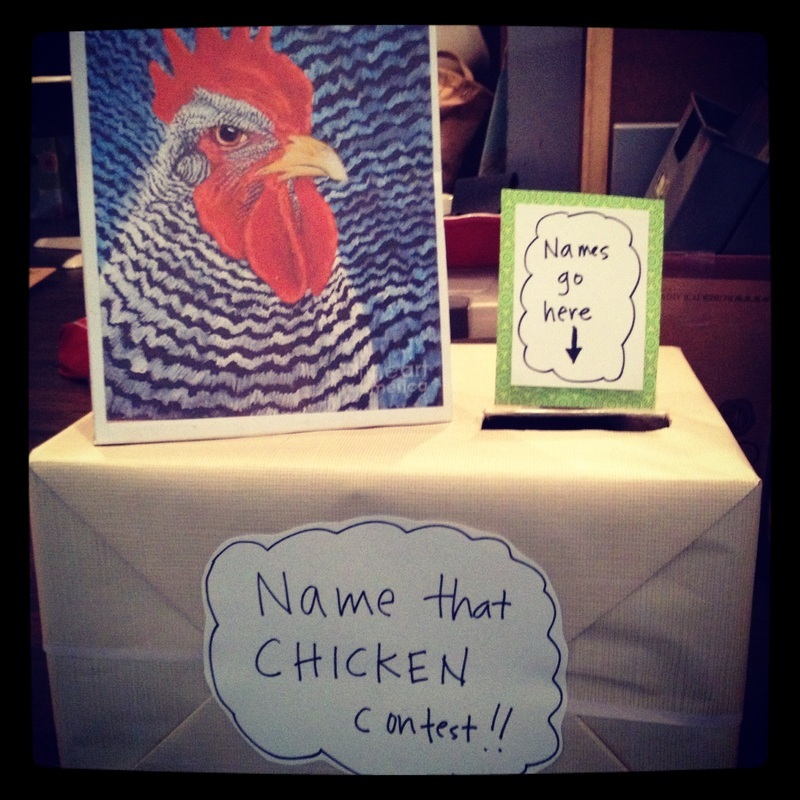 The bonus is that our free range, all organic chickens will produce the best eggs out there. And they are just fun. Each chicken has its own distinct personality, they do silly things to entertain themselves which in turn entertains us and best of all, they make you slow down. We seriously have one of the best chicken coops ever. After looking at a lot (A LOT) of pictures of chicken coops online, we drew up our wish list of chicken amenities and went looking for a builder. Charlie Hall was recommended by our friend and chicken owner Matt Binns and we are so happy to have found him. He drew up some fantastic plans that included a large storage area for supplies, a removable nesting box for easy cleaning access, lots of run space and a shady place to hide, a slanted roof so that we could attach a rain barrel to a gutter downspout and an automatic coop door that runs on solar power. Quite the laundry list. Oh, and could he please use reclaimed lumber from The Rebuilding Exchange. He agreed to all of our demands and so we gave him the green light. For those interested: we use a deep-liter method of pine shavings in the nesting boxes and sand on the coop run floor. We have had absolutely no problems with smell thus far. We plan to replace the pine shavings twice a year and do a once a year full coop clean. 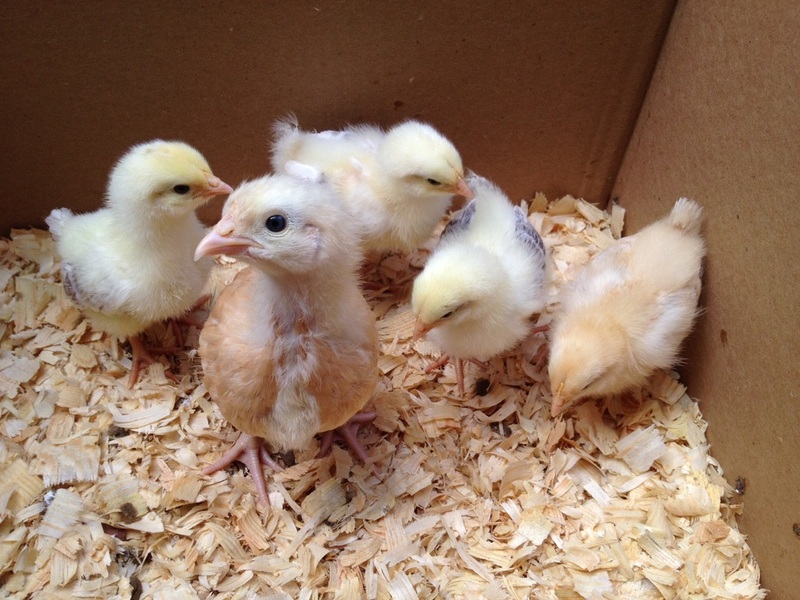 We purchased our six chicks at Belmont Feed & Seed on April 1, 2013 when they were a week old. Two Buff Orpingtons, two Plymouth Rocks and two Ameraucanas were selected for their winter hardiness and most importantly....they are kid-friendly. 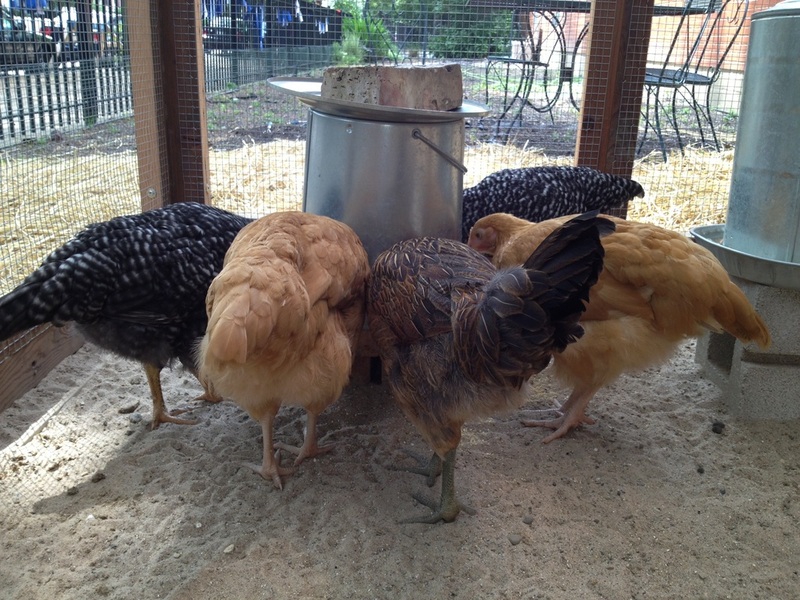 The site Backyard Chickens was super helpful in choosing the breeds and drawing up coop plans. We rotated the box of chicks between four families over the course of a number of weeks. We even set up the box in the hallway of the school for a bit so that all students could meet the newest members of the Mayer family. Our new friends grew pretty quickly and they also were very pretty so we did a little photo shoot one afternoon. Did we mention that they grew pretty quickly? Soon that cardboard box was not big enough so kind Dr. Ken from Family Pet Animal Hospital built us a small coop for our teenage chickens. Two things: we read that if you man-handle chicks when they are very young, the more friendly they will become when they are full grown hens so we hung out and bothered the chicks a lot. They would sit on our stomachs and watch t.v., lay on our laps and fall asleep; we would eat dinner out with the chickens out in the garage. You know, regular stuff like that. Also, when you have a small coop with six young chickens in your garage and you live on a busy street and the garage door is open....cars, bikers and pedestrians will stop in their tracks and yell, "Are those real chickens?!" Ever. Single. Time. The chickens were growing, the coop was being constructed and now we needed to name our hens so we held a school-wide chicken naming contest. All students and Mayer faculty were eligible to submit one name...just write it on a piece of paper and place it in the box. Winners were announced over the school loud speaker during our chicken pep rally. Wait......a chicken pep rally???? Yep! 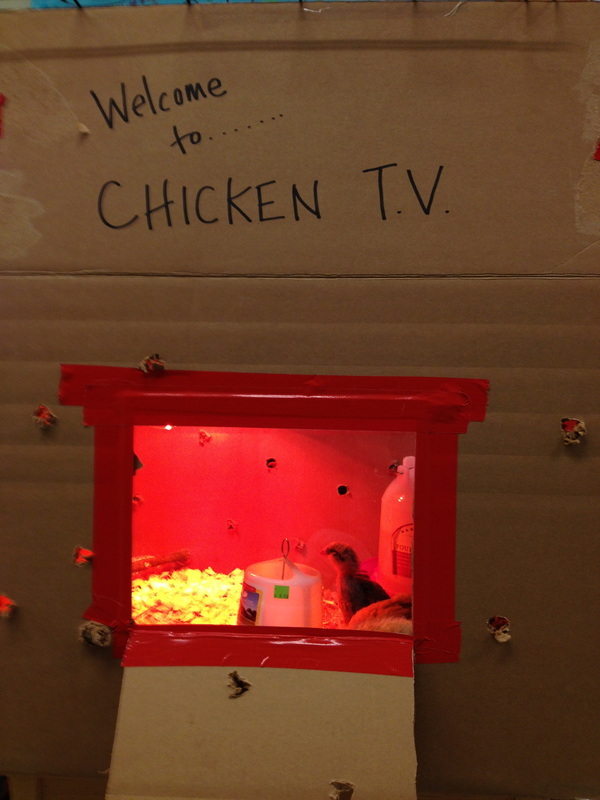 We held a school-wide chicken pep rally to transfer our chickens into their new and beautiful coop...no more garage living for these young hens. Each class lined up in the hallway while our P.E. teacher Coach Francis announced the chicken name winners over the loud speaker. 600+ students and teachers cheering and clapping and fist pumping......it was truly a morning to remember. 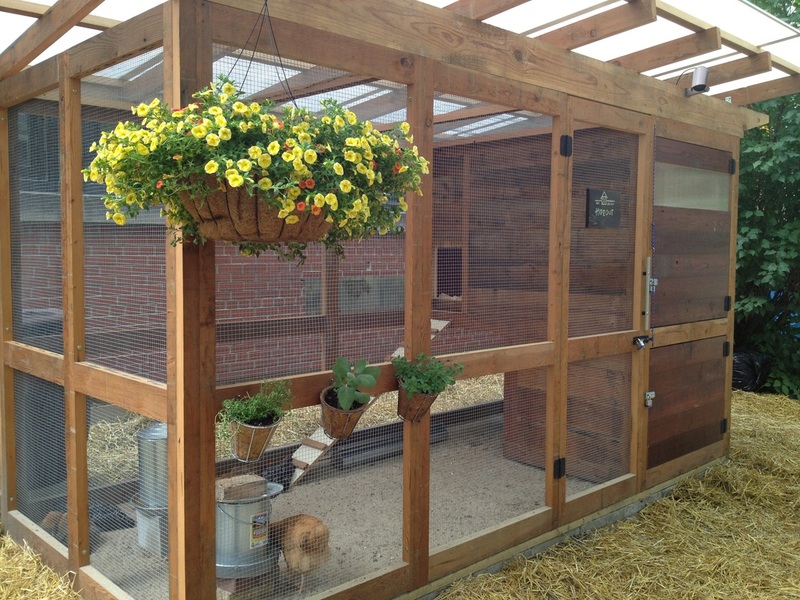 So the chickens settled into their new home perfectly and you'll never guess what happened?! The whole neighborhood fell in love with the chickens. Really. It happened. 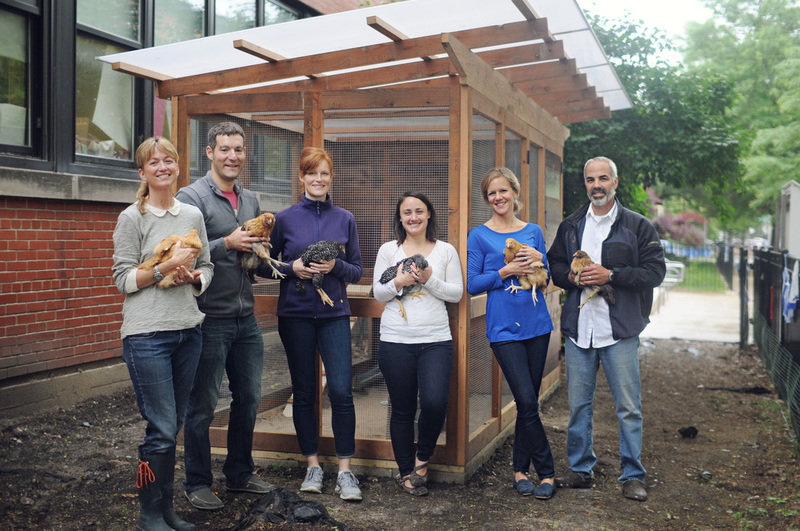 We knew the kids and families of the school would think that the chickens were pretty neat but we didn't bank on the fact that 6 city hens could become such a community builder. Folks now alter their dog walking route so that they can visit with the hens twice a day, neighbors come over and talk to each other, people stop and ask questions and just about every single person leaves with a smile on their face. It has been the biggest surprise of all and we could not be more thrilled. It does seem that every time we visit the coop there is a need to take pictures of the chickens. They are just so gorgeous and regal and when the light shines on those beautiful feathers in just a certain way it's kind of breath-taking. Shocking announcement......KIDS LOVE CHICKENS! They really cannot keep their hands off the chickens. They chase the chickens, they cluck like chickens, they walk like chickens, they carry them around like a football, they make the chickens fall asleep in their arms, they ask one million questions about the chickens and it's just a beautiful thing. 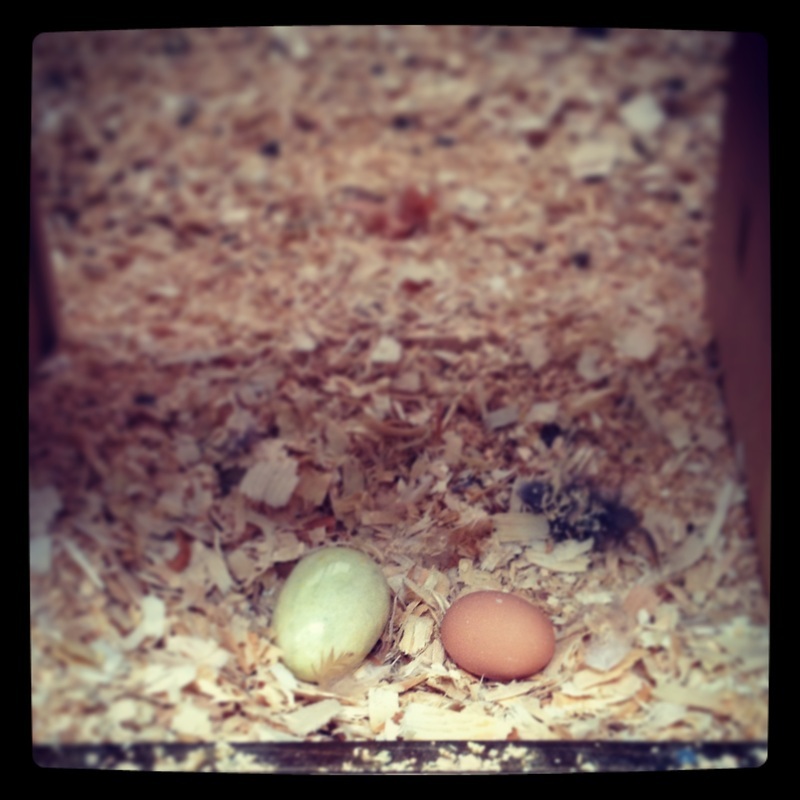 As our hens began nearing their six month mark, we started to get really excited about the first egg! Who would lay it? Which one of us would find it? Who gets to eat it? We never once thought that something might go wrong (we are a very optimistic bunch) but something did go wrong. One of our chicken volunteers noticed that Millie Mariposa was not acting quite right. She wouldn't come out of the coop, kept her eyes closed and had some sort of runny poop situation. Luckily, (we are so lucky!!!!) we have veterinarian Dr. Lynn Lewin of Family Pet Animal Hospital on our Chicken Committee. We brought Millie into the clinic and it was obvious that she was trying to lay an egg but was having some serious difficulty getting it out. When this happens to a chicken, it's called egg bound and can be fatal if the eggs cracks open inside the hen. Dr. Lynn took some x-rays and lo and behold, the egg was giant. We tried some tricks of the trade (hot compresses, etc) but no luck. Dr. Lynn reached out to Dr. Dianne Poliakoff at Midwest Bird & Exotic Animal Hospital who showed her how to manual extract the egg from Millie. After a few days of rest away from the other chickens, Millie came back to the coop in perfect health. On September 19th, 2013, 5th grader Ella D. opened up the coop nesting box door and discovered the first fully-formed, regular-sized, laid properly and perfect in every way egg! It was sitting right next to the fake yellow marble purchased in Chinatown egg.....which is there to show the hens "hey, you lay your eggs here and not down there by the food and water". We have no idea which chicken laid our first egg (note to self: set up chicken cam) but she did an outstanding job. We were so excited about this first egg that we ran into the school and interrupted every single classroom in every grade to share our good fortune. 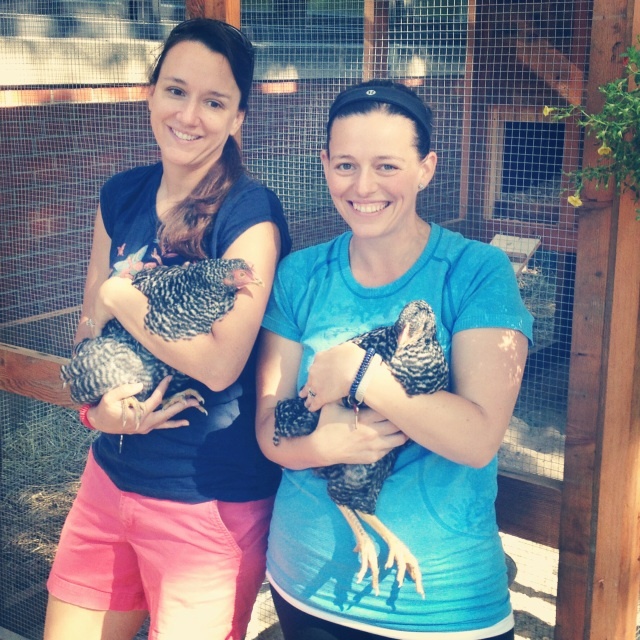 Bravo to our wonderful Mayer teachers who embrace spontaneity when it comes to the chickens! Since that day, all 6 hens have begun to lay eggs. They are still getting into the swing of things and some eggs look a little wonky but before long, they will all get the hang of it. Did you know that a hen is born with every egg she will ever lay? And that most chickens lay an egg every 25 hours? And that all eggs taste the same no matter the color of the shell? And that Ameraucana's lay blue/green eggs? And that you do not need a rooster in order for a hen to lay an egg? Or that you don't have to refrigerate a freshly laid egg as long as you don't wash it? Well, you do now! Today, Mrs. Abraham's 6th grade class came out to the garden to learn about the chickens, composting and some of our cool coop features. The kids asked amazing questions and seemed really interested in the rain barrel and the coop's solar panel. They are presently learning about soil so our talk about how compost works and why it is important fit in perfectly with the unit. We spent an entire hour presenting and answering questions...what a wonderful opportunity to be able to take that much time to explore how sustainability really works. As this is a learning process for us all, we now know two things: rock salt is toxic for chickens and if you feed too many treats to your chicken, it will become obese. And so we have lost two of our beloved chickens: Sly Buttercup died over the cold winter and Lady Cluck Rose died in March. We have also learned that chickens can die for absolutely no reason at all. 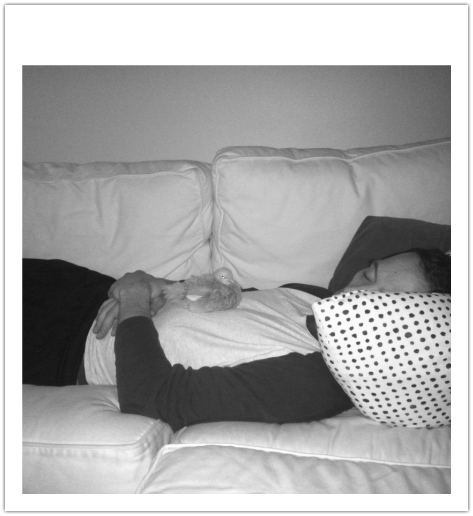 They just keel over. So we have decided to add to the flock! 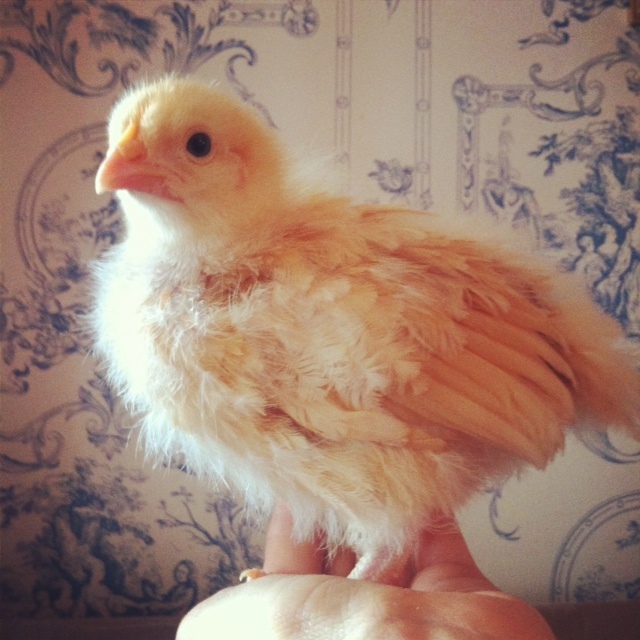 This June we welcomed 5 new chicks: Two Buff Orpingtons and three Delawares. As of today, we have 6 hens at Mayer: 3 of our original 6 from 2013 and 3 that we added in 2014. Our older chickens are Big Blue Nugget (Plymouth Rock), Millie Mariposa (Plymouth Rock) and Chicken Serious (Ameraucana) and our younger chickens are Turbo Goose (Delaware), Pepper Snowball (Delaware) and Miss Pearl Feathers (Buff Orpington). Some dedicated chicken volunteers: Leah and Stephenie!